From delicate telecom wiring to precision pole-climbing, from mission-critical aerospace cables to CAT6A, conductor prep has become an art form. The signals and locations where technicians are working mean that nicks from the wrong size slot (or twists from using unsized cutters) make the job difficult, if not impossible. In the shop, high-cost thermal and laser wire strippers meet modern needs but are not practical in the field. A nicked conductor — or a cable that fails due to guessing proper stripping length because the conductor is exposed — can be the root cause of complex problems. How challenging is diagnosing intermittent data transmission errors or grounding problems under time and cost constraints? High current wiring can be compromised over time. Improper wiring operation in vehicles or other mechanically demanding situations can produce system failures. Proper and accurate wire stripping serves as the proverbial “ounce of prevention” that avoids cascading downtime and repair costs. Quality wire strippers provide repeatable and reliable results. 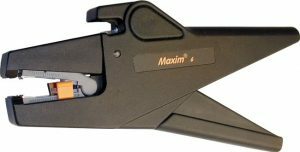 Consider the Maxim® 6 Ergonomic Self-Adjusting Wire Stripper. Because of its ergonomic handle and autoform stripping jaws, the stripper forms neatly around any radius cable, safeguarding the inner conductor from nicks. Since it features a built-in wire stop and can take round, oval and flat-wire cable, it is both versatile and reliable. Those are a lot of conditional expectations; if anything is less than ideal with most cutters and strippers the field technician leaves behind wire damage, conductors of improper length, and bad connectors. Use is greatly simplified. The wire rests in place. Operation is fast, accurate and easy to repeat. Up a pole, where single-handed operation is a must, technicians appreciate the Minim®’s simplicity. Large-scale wiring jobs are much more likely to quickly pass testing and operate without failures in the long term. Solar panel systems use high-current DC wiring. These large conductors are compromised by even small nicks. Data and logic systems with high density wiring make use of conductors as small as 30 ga. Such small gauges are difficult to handle and require highly accurate insulation removal. 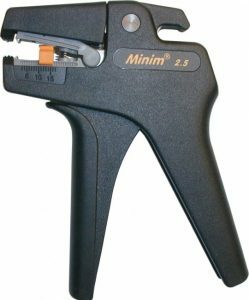 Advanced wire stripping tools such as the Maxim® and Minim® handle these demanding wire installations. Technicians can avoid wire damage and replacement. The finished connections are reliable and strong, with the specialized wires spared stresses that could lead to breaks or fatigue. Wiring harnesses and other factory-produced solutions can use laser wire stripping and heat-based systems, but single-wire field repairs and installations are still predominantly done with mechanical tools. 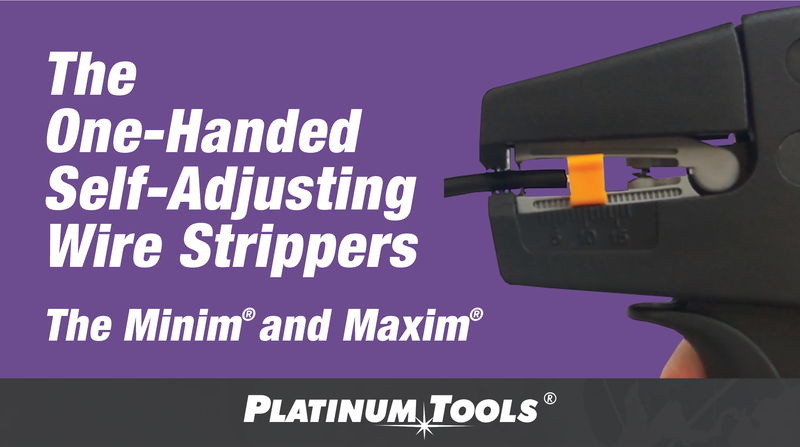 The Maxim® and Minim® advanced wire insulation removal tools are available to meet these needs confidently and securely.